Photo by Chris Dorst – Trump supporters protest across from Logan Middle School, Sunday, before Bill Clinton’s arrival for a rally. For the last four or five years, one of the rally cries among the “War on Coal” crowd has been that it was unfair for the Obama administration to be putting in place new environmental rules on coal-fired power plants without coming to the coalfields to hear from people whose “way of life” might be affected. On this blog, I’ve actually made this point myself — and agreed that Sen. Shelley Moore Capito, R-W.Va., was right to push for a visit and a public hearing by U.S. Environmental Protection Agency Administrator Gina McCarthy. So naturally, when the leading Democratic presidential candidate’s campaign plans a visit to Logan, the local establishment puts out the word that former President Bill Clinton isn’t welcome in their town. And local supporters of Republican front-runner Donald Trump show up to put their best foot forward in seeing that the region’s economic concerns get a fair hearing. Of course, one of the major problems here is the flawed notion that if the EPA just dropped its efforts to do something about climate change, the coal industry would suddenly rebound. Kevin Stone works for National Armature and Machine, a motor and water pump service business in Holden, Logan County. Arnold Killen, of Harts in Lincoln County, held a Trump sign outside the Logan rally. Did he think Trump would bring back the coal industry? Inside the cafeteria, where the crowd ultimately drowned out protests, there was far more Clinton support. Anita Weyenberg, Bryant’s sister and another Clinton supporter, noted that they were both daughters of a coal miner. 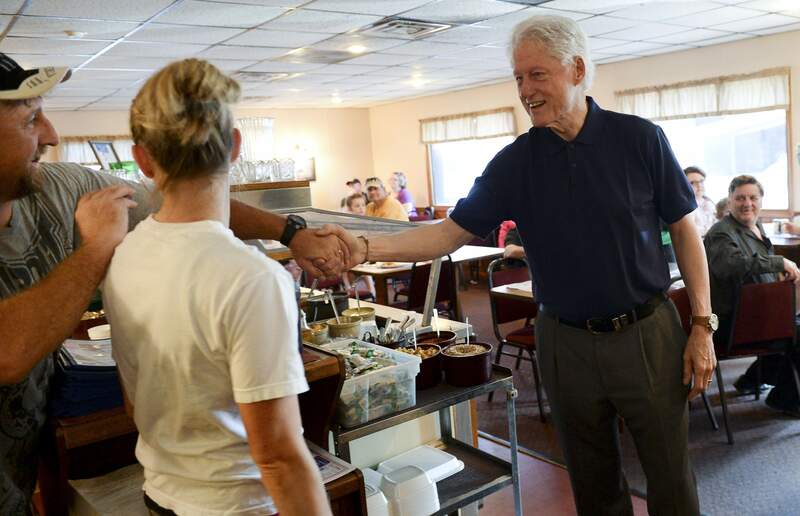 Photo by Chris Dorst – Clinton shakes hands during a stop at the Park Avenue Restaurant in Danville. Still, it’s worth remembering that a lot of the political fallout here in West Virginia has been fostered by the attitude that state Democratic leaders like Sen. Joe Manchin have taken. Their rhetoric about the Obama administration’s coal policies hasn’t exactly been calm and thoughtful. Gov. Earl Ray Tomblin, a Logan County native, has only recently started to back off his own belief that another coal boom was just around the corner. And, of course, the state Democratic front-runner for governor is a billionaire coal operator with a record of not paying his taxes, his bills or his safety fines, who casually tosses out the notion that climate change is a lot of “smoke and mirrors,” and insists that if voters will just elect him, West Virginia will end up mining more coal than ever before. 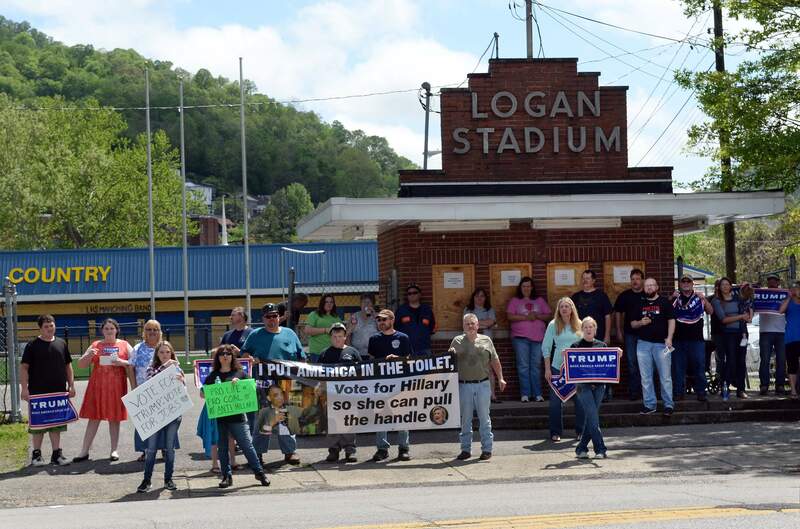 West Virginia’s southern coalfields are in need of help, and hard discussions need to be had about the future of those communities and our state. A political campaign can be more than 30-second attack ads, rude rally signs and boastful promises with no basis in reality. Voters need to demand more and only support candidates who will offer more.